The Cy-Visor is the first HMD which adopts SVGA reflective of LCOS. The display engine is a complete optical microdisplay module that includes the field sequential color of MD800G6 SVGA microdisplay with 1.44 million effective pixels, providing a resolution-scale solution for various types of content. Its light weight, compact size, wide inter-pupillary distance (IPD) and high resolution provide end-users with comfortable viewing. 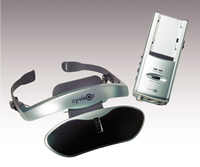 Use the large virtual screen of Cy-Visor as your confidential PC display or personal DVD movie theatre.